I'm going to start off this beauty DIY series with the 2-in-1 Charcoal congestion busting & exfoliating face mask. I've tried lots of DIY facemasks over the years and only the best have stuck. When I was still at school it was like a little Sunday morning ritual for me to watch Castaway (anyone remember Castaway? Is it still on??) and slather on a homemade facemask. It might've been the lovely glowy skin that comes from living on a desert island seeping into my subconscious, but a good little facemask was the closest I was getting to a sandy beach and sun sun sun! Now, this isn't the kind of charcoal you put on your barbecue, but big pills (or capsules) you can buy from the chemist or online for about £4 for 100. 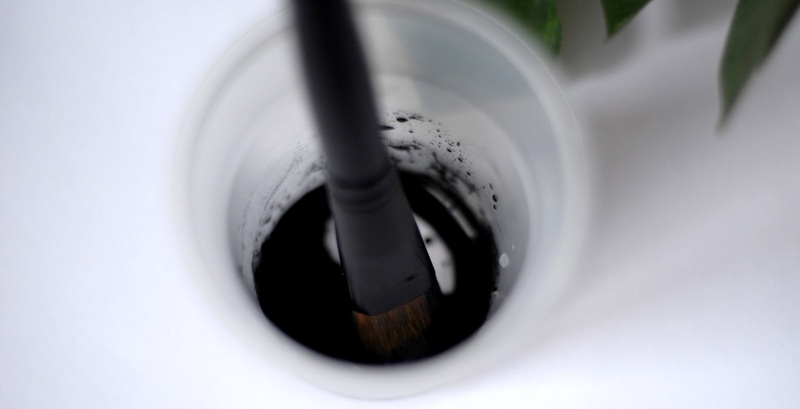 This is activated charcoal and it has a huge surface area (one teaspoon has a surface area of more than 10,000 ft) that can absorb up to 10 times its own weight and size in chemicals and toxins. Activated charcoal is one of the main treatments for poisoning in pets and humans, and I've actually found its a brilliant hangover preventer if you take a few pills with lots of water before bed! The mask above was made with Glycerine and and an Aspirin tablet, my skin has been congested but also quite dry recently so this is the combination I chose. To make your mask, first open the capsules or crush your tablets. The easiest way to crush them is between two teaspoons over your mixing container. The charcoal won't dissolve so you want to make sure you crush it the best you can, as well as drawing out toxins and congestion it will exfoliate the skin so you don't want it too gritty. Next add in the rest of the ingredients and mix well, I added just a teaspoon of water to wet the mixture and a couple of drops of glycerine to hold the hydration onto my skin. You can put this straight onto clean skin but I like to steam my face for a few minutes first to help it get right into the pores. Also, don't wear white! The mixture is liquid and although it shouldn't be drippy it does get a bit messy to take off. Apply the mask onto your face with a brush or fingers and let it sit for 5 -10 minutes until it dries, its very very black so don't get it too close to your nostrils or you'll have dark snot for a while after! Once its dry take a wet flannel, muslin cloth, cotton pad (or you can just use your fingers) to remove the mask, this is where the exfoliation comes in and you can massage very gently in small circles on any congested or flaky patches to make your skin super soft. Once its all washed off your skin should be smooth and completely clean! Because this is a detoxing mask it can bring congestion to the surface so will speed up any breakouts you have and you might notice a few blocked pores unblocking themselves in the next day or two. I like to use this mask at night and follow with a good thick night cream to prolong the smoothness. Let me know if you try this mask, or have any great DIY recipes yourself!